It’s a way of life the locals call “tranquilo,” and it led Bobby Hottensen to take a leap of faith and trade a fast-paced urban lifestyle in Washington, D.C., for the laid-back tropics of Nicaragua. Hatching an idea to change that, the friends went to work raising funds, developing a business plan and scouting the area. And in early 2013, New York City native Hottensen left behind his job in D.C. and made the move to Nicaragua’s Pacific coast to start the country’s first craft brewery. After some initial trials and tribulations, “The Cerveceria” opened in late 2014 and has grown into a bustling 100-seat brewpub that annually produces about 350 barrels and serves about 20,000 customers — an eclectic mix of backpackers, surfers, adventure travelers and locals. Construction is underway on an expansion that will double the business’ production and add a bottling line for product slated to be distributed throughout Nicaragua in the late spring. 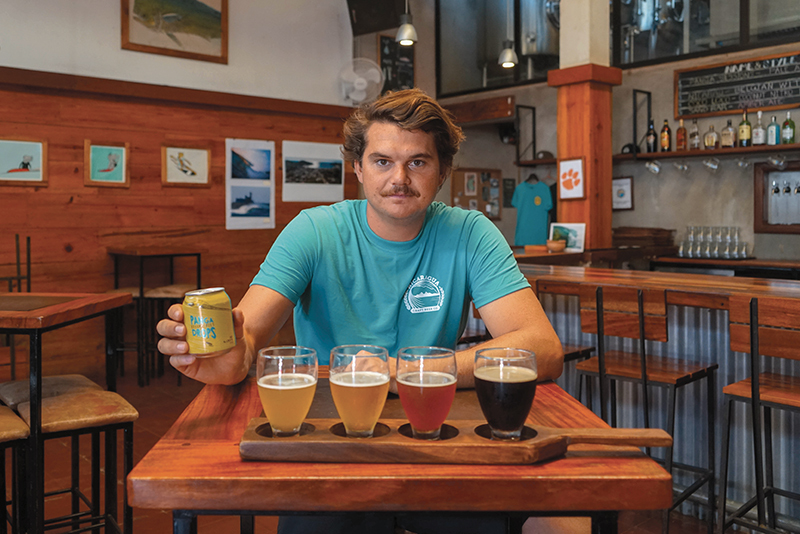 After breaking new ground in the craft brewing industry in Nicaragua, the Clemson alum and his business partners are working to share a taste of the country’s laid-back lifestyle with the United States. In September 2017, Hottensen and his partners launched Nicaragua Craft Beer Co. in New York and Los Angeles. The concept: to leverage the allure of Nicaragua that they had fallen in love with and ride the wave of America’s fast-growing premium import market segment. And the vessels for sending that “tranquilo” lifestyle back to the United States are 8-ounce squat cans filled with a brew dubbed “Panga Drops,” a crisp, unfiltered Keller Pilsner that sits at the intersection of a hyperlocal craft beer and an easy-drinking Mexican-style beach beer. “The packaging is probably the most unique thing,” Hottensen says. “It’s an 8-ounce craft beer, which is the same footprint as the normal 12-ounce can, but just shrunk down. The idea is that down here it is so hot, and you’re drinking a can of beer on the beach, and the last couple sips are always pretty warm. So, we just decided to eliminate them.”While the initial launch was limited to New York and L.A., Hottensen hopes that the beer can reach a much wider audience. The company now has distribution in D.C. and Maryland and is adding Rhode Island, with hopes of eventually reaching South Carolina and Georgia. Working to help spread the brand’s footprint is another Clemson graduate: regional marketing representative Catherine Czerwinski, who finished her bachelor’s degree in marketing in 2012 after a senior-year internship for Sweetwater Brewing Company. Czerwinski’s father operates a distributorship, so the beer business runs in her family. But after she graduated it was a random encounter with Hottensen that led to the opportunity for the two college friends to team up. Czerwinski continued living in Costa Rica for nearly three more years but would visit Hottensen in Nicaragua to follow the development of his business. After moving back to the United States, Czerwinski’s location in New York made her an ideal candidate to help Hottensen and his friends launch their products in America. A Delaware native, Czerwinski’s choice of Clemson came because her older sister attended college in North Carolina, and she wanted to head south for her own collegiate experience, too. She knew very little about Clemson when she applied — and had never even visited campus before freshman orientation. From a marketing perspective, Czerwinski said Panga Drops occupies a unique corner on the American beer scene as both the only 8-ounce can currently on the market and the only craft export to come out of Nicaragua.